Micah Swimmer oversees a class of Eastern Band Cherokee language learners at the New Kituwah Academy in Cherokee, N.C. Behind him, a bulletin board displays the names of the few remaining fluent speakers of his Cherokee dialect. Four days a week, Micah Swimmer facilitates an all-day language session between young adults who are learning Eastern Band Cherokee and older, fluent speakers. He points to the back of his classroom at the New Kituwah Academy in Cherokee, N.C. It's early September, and sheets of paper on a bulletin board display the names of 226 Eastern Band Cherokee members. "That's all we have out of [about] 16,000 enrolled members," he says. "That's all we have left that are fluent speakers." The Eastern Band Cherokee have been speaking their native language in the mountains of what is now North Carolina for more than 1,000 years. But today, most of the remaining speakers are over 50 years old. And many of those who teach the language — including Micah and his younger brother, Jakeli Swimmer — aren't fluent. Like many other Native Americans, the Swimmers have been struggling to save their language from extinction. According to UNESCO, their Eastern Band Cherokee dialect is "severely endangered." "If we're not speaking Cherokee, then what are we?" About 40 miles away, in the small mountain town of Robbinsville, Jakeli teaches his Cherokee language and culture at a public elementary school. He travels from classroom to classroom, giving half-hour lessons on folklore and vocabulary using his own illustrated slides. Both brothers say they're working to preserve their Cherokee culture, as well as their own heritage and identity. "I mean, if we're not speaking Cherokee, then what are we?" Jakeli asks. "It's what makes us unique." And they're running out of time. Jakeli estimates the tribe has about 30 years left before the last aging speaker is gone. Jakeli Swimmer teaches a Cherokee language and culture class at Robbinsville Elementary School. For the Swimmers, learning the language hasn't been easy. They picked up some vocabulary from their grandmother when they were children, and both took Cherokee language classes in high school and college. Sometimes when the brothers talk on the phone, they'll start out speaking Cherokee. Jakeli says, "We talk until we're uncomfortable, which is a few sentences." "This book is my lifeblood," he says. "This little thing is what's keeping me driven." "There aren't teachers to teach these classes"
Native American language programs are often staffed by instructors who aren't fluent. "There aren't teachers to teach these classes," says Jioanna Carjuzaa, head of Montana State University's Center for Bilingual and Multicultural Education. 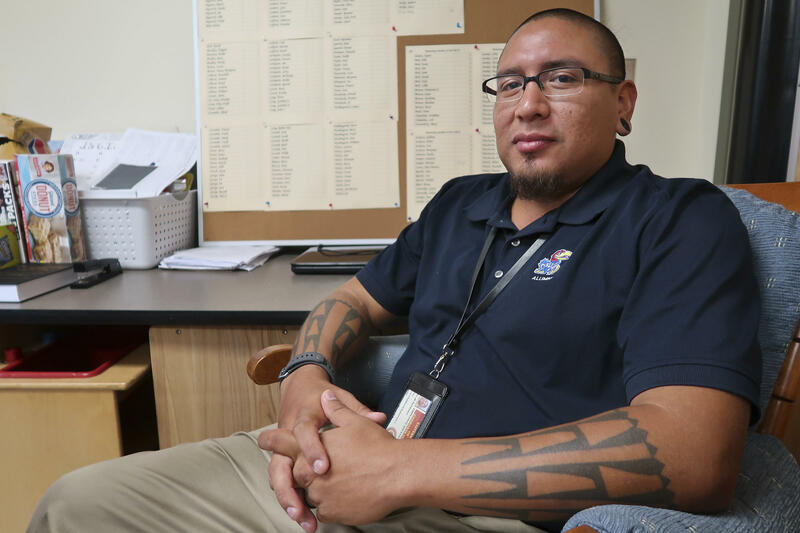 Carjuzaa works with Native American language programs around the country. She explains that through the 1970s, when many of today's fluent speakers were young, schools often discouraged students from speaking Native languages, sometimes even punishing them for it. English dominated, and parents stopped passing their Native languages on. A generation gap emerged, and today many tribes are working to overcome it. "Speakers in multiple generations is how you save a language or keep it vibrant," she says. 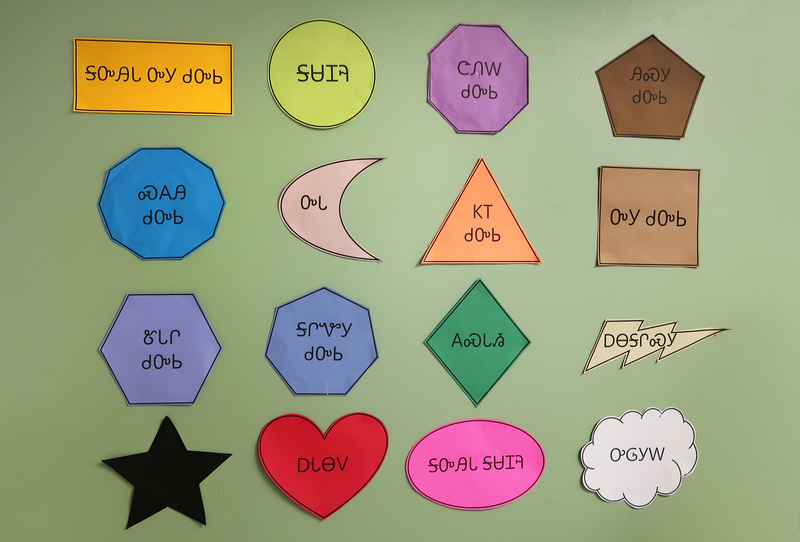 A wall at the New Kituwah Academy shows cutouts of shapes with their corresponding names written in Cherokee. Jakeli and Micah know what can happen when a generation loses its language. Their parents weren't fluent, but their grandmother was. Jakeli says he wishes he had spent more time listening to her when he was little, at an age when he could have just soaked up her words. "There [were] some days Grandma would just speak Cherokee and it'd just kind of click," he remembers. Their grandmother, Amanda Swimmer, died in November at the age of 97. Soon after, Micah took her off his list of remaining Cherokee speakers — one of five names he has removed since September. And with her death came a larger responsibility. Jakeli says his cousin turned to him the night she died. "It's up to you now," he told him. "You have to learn it and speak it right." There are fewer than 230 fluent Eastern Band Cherokee speakers left. In North Carolina, two Cherokee brothers are working to save that language and their identity. From member station WUNC, Liz Schlemmer reports. MICAH SWIMMER: You see that wood back there in the corner? LIZ SCHLEMMER, BYLINE: Micah Swimmer points of the back of his classroom at a language school in Cherokee, N.C. There, printed sheets of paper display the names of fewer than 230 Eastern Band Cherokee members. M SWIMMER: That is over than 16,000 enrolled members. That's all we have left that are fluent speakers. SCHLEMMER: For more than 1,000 years, the Eastern Band Cherokee have been speaking their native language in what is now the North Carolina mountains. But today, most of the remaining speakers are over 50 years old. The Eastern Band dialect of Cherokee is considered severely endangered by UNESCO. Four days a week, Micah facilitates an all-day language session between young adults who are learning Cherokee and older, fluent speakers. M SWIMMER: Because if we don't teach these adults how to talk, you can't make the kids talk Cherokee. If they don't have it at home from their parents, they're not going to talk it. SCHLEMMER: About 40 miles away in Robbinsville, Micah's younger brother Jakeli Swimmer teaches Cherokee language and culture at a public elementary school. JAKELI SWIMMER: Now, if you want something, you just say (speaking Cherokee). SCHLEMMER: Both brothers say they're working to preserve their culture, as well as their family heritage and identity. Here's Jakeli. J SWIMMER: If we're not speaking Cherokee, then what are we? Because that's what makes us unique. SCHLEMMER: And they're running out of time. J SWIMMER: Worst-case scenario for the language - I'll say 30 years. SCHLEMMER: Like most Cherokee their age, neither Jakeli nor Micah are fluent. They both took language classes in high school and college. Jakeli writes down new phrases he learns in a little black notebook that he carries around with him. He says sometimes when he and his brother talk on the phone, they start out speaking in Cherokee. J SWIMMER: We talk until we're uncomfortable, which is a few sentences. We'll talk - (speaking Cherokee). SCHLEMMER: Then they'll switch to English. 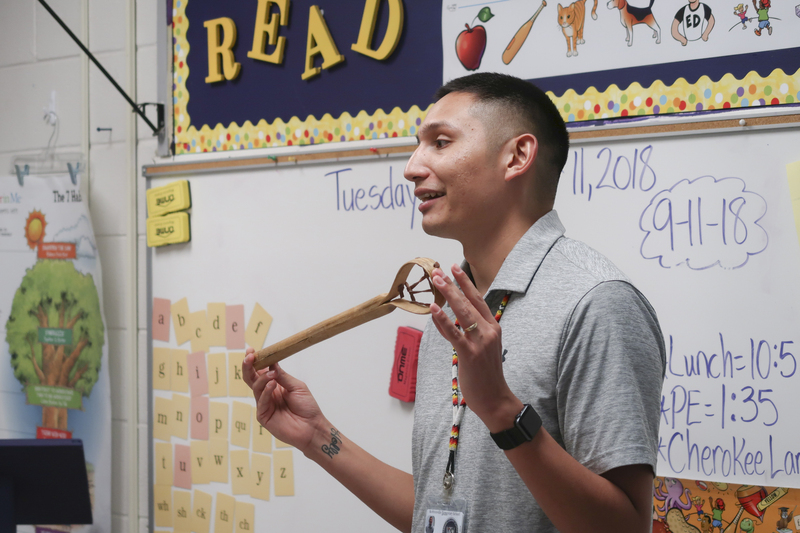 It might be surprising that these two Cherokee teachers aren't fluent in their language, but that's actually not uncommon for Native American language programs. Jioanna Carjuzaa runs the Center for Bilingual and Multicultural Education at Montana State University. She works with Indigenous language programs around the country. JIOANNA CARJUZAA: We've been trying to really promote immersion programs, but there aren't teachers to teach these classes. SCHLEMMER: About half of all languages indigenous to the U.S. and Canada have disappeared since 1492. Carjuzaa says through the 1970s, schools often discouraged students from speaking native languages, sometimes even punishing them for it. Parents stopped passing their native languages on, a generation gap emerged. Now many tribes are working to overcome that gap. CARJUZAA: Speakers in multiple generations is how you save a language or keep it vibrant. SCHLEMMER: Jakeli and Micah learned that from experience. Their parents weren't fluent, but their grandmother was. Jakeli says he wishes he'd spent more time listening to her when he was little, at an age when he could have just soaked up her words. J SWIMMER: There are some days Grandma would just speak Cherokee. And it just kind of clicked. She might say something and go - point over there. And you might not know exactly what she's saying. But that instruction kind of leads you to that way. SCHLEMMER: Jakeli and Micah's grandmother died in November at the age of 97. Micah removed her name from his list of remaining Cherokee speakers. Jakeli says his cousin told them, it's up to you now. You have to learn it. And speak it right. For NPR News, I'm Liz Schlemmer in Durham, N.C. Transcript provided by NPR, Copyright NPR.